André's Confiserie Suisse was opened in 1955 by André Bollier, who moved from Switzerland to Kansas City to pursue his dream of opening his own chocolate shop. 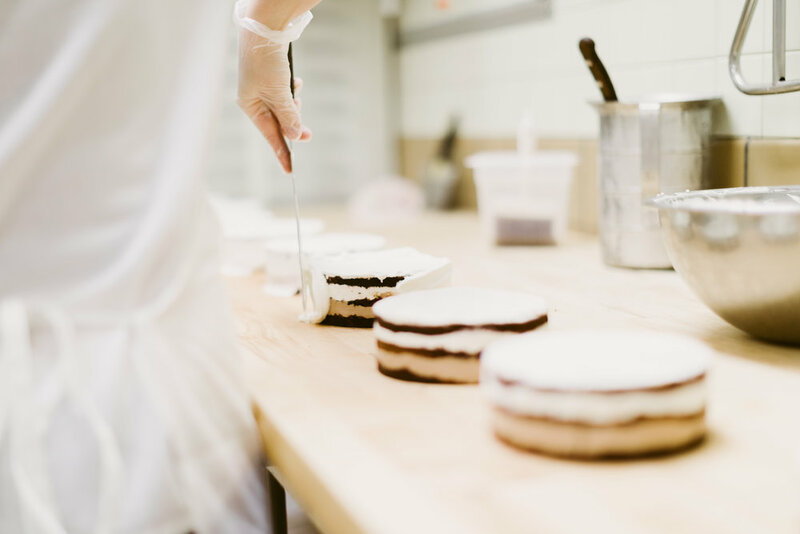 Three generations later, André’s is still serving up Swiss traditions in Kansas City with delectable chocolate, food, and pastries. René Bollier has been working in and around Andre’s since he was 5 years old, training alongside his father and grandfather. Now he carries on the family legacy with his wife, Nancy Bollier, who runs wholesale and marketing. Tell me about the incredible history of André's. André Bollier apprenticed then trained as a master pastry chef in Switzerland. He dreamed of opening own his own chocolate shop but it was too expensive. He was told by his brother, who was working for a Swiss watchmaker at the time, that there was opportunity in Kansas City. He and his wife Elsbeth Bollier immigrated to the US in 1955 with the dream to open their own shop. André created his own cookbook and sold it to raise money for the trip. Initially, they were able to open a small storefront at 5010 Main (next door to the current building). At first, visitors didn’t understand why they’d pay more for chocolate when they could find a brand across the street at the grocery store for less. As people traveled to Europe and learned the art of chocolate making, they learned to respect and appreciate the confections that Andre was creating. In 1956, a tea room was added to serve traditional Swiss style lunches. This helped to bring people in, with the hopes that they would purchase chocolates on the way out. André's son Marcel and his wife Connie trained in Switzerland after college at KU. Upon their return in 1974, they made a pivotal move. They purchased large machinery which enabled them to expand chocolate production and sell to a wider market. The customer base grew, and André’s was able to build what now stands at 5018, next door, in 1976. René, grandson of André, started working in and around the business when he was five years old. He worked weekends and holidays through grade school and high school, training alongside his father and grandfather. After attending the University of Kansas to obtain a degree in business, he followed his father’s footsteps and went to Switzerland to master the art of pastries and chocolate (the best place to do this, he said). He apprenticed with various pastry chefs around the country. He was joined by his now wife, Nancy, and returned with her to KC in 2002. Rene now runs the business and is the third generation Bollier to start in the kitchen at 3 am to create chocolates, baked goods, pastries and tortes for the community that has made André's a tradition for over 60 years and counting. A coffee + wine bar was added in 2014 in what used to be unutilized office space. We’ve always loved the coffee shop scene in Switzerland and wanted to bring that feel back to KC. The new addition has swiss roots with influence of modern, Swiss architecture. It attracts a younger demographic as well as opening up the front retail space to Main Street. How was André's received in Kansas City when it first opened in the ‘50s? What was the craft chocolate scene like then? At first, visitors didn’t understand why they’d pay more for chocolate when they could find a brand across the street at the grocery store for less. As people traveled to Europe and learned the art of chocolate making, they learned to respect and appreciate the confections that André was creating. In 1956, they added the tea room to serve traditional Swiss style lunches. This helped to bring people in, with the hopes that they would purchase chocolates on the way out. There was no craft scene at this time - it was nonexistent - which is what made the first ten years so hard. André and Elsbeth spent much of their time trying to educate the Kansas City public about luxury chocolates, European chocolates and pastries. They did this by getting involved in the art community (which we still strongly support). It was always very important to them. They donated time and products to events hoping that the community would try their confections and embrace what they were doing. What was your experience training in Switzerland? I had a unique experience, because the relationships my grandparents and parents created, to work in three very different pastry shops over a three-year period. Each one differed in size and product assortment which gave me a great education in a variety of different culinary realms. What is unique about the Swiss tradition of chocolate-making? The Swiss invented milk chocolate. The traditional Swiss recipes involve conching, a unique way of creating the finished product. They conch chocolate for an extended amount of time, creating heat which gives the chocolates caramel notes and gives the finished product a rounder, smoother flavor profile. Getting to see the process of turning cocoa beans into rich, smooth chocolate is amazing, Even at a young age. It never gets old, and Swiss chocolate is the best chocolate in the world. My favorite is the special dark, single-origin chocolates which like wine provides a flavor profile very specific to the region in which it’s grown. It’s incredibly smooth and decadent. This high-end line is clean, non-GMO, free trade, vegan, kosher, dairy free and gluten free. How did you know you wanted to carry on the family legacy? I never wanted to do anything else. I love the creativity as well as the ability to create something that makes people happy. The business has never been forced upon any of us. It has always been the choice of the individual whether or not we wanted to continue the André's tradition. My dad was very proud when I made the decision to continue the tradition. André's brings our family together. It’s not always easy, but it’s fun. What are some of your favorite memories growing up around André's? The family environment that my parents and grandparents created. Working alongside my father and grandfather. Coming in to work to help and learn. Working alongside Annedore, of Annedore’s chocolates. She started at André’s as the head of chocolate production for ten years. She was one of the first people to help introduce and teach me about chocolate candies. I used to say that when I grew up I’d marry her. I was only five years old, and she let me make whatever I wanted. When the kids met her recently, I told them that story. They looked at their mom in shock and horror. Nancy just laughed. She won. I loved working in the business throughout high school and college. I’d go out late with friends but still wake up at 3 am (sometime as early at midnight during the holidays) to come to work. My family has always been the group that inspires me. Each person in different ways. What are your roles at André's? What is it like working as a husband-wife team? I do everything from helping to manage production, making contacts with suppliers, and run the day to day operations which often includes cleaning toilets. I do a bit of everything but love when I have time to get into the production area and create. Nancy used to run mail order and wholesale before we had kids. She stayed home for ten years to raise a family. When the kids got older and she was ready to come back, there wasn’t a place for her to work because she had trained people to take over her job. Through the contacts we made, she was able to get an account management position at a local design agency. She was happy, and we were so impressed with the work they did that I hired them to do our rebrand in 2017. They did such a great job that it increased sales and helped bring the business into the next generation. Nancy unknowingly created a job for herself back at André’s and we are thrilled to have her running wholesale and marketing. Shawnee Mission High School. Football game at South stadium, 1989. I saw her from afar and knew she was special. What are some of your favorite André's treats? Depends on the day. There’s so many to choose from and I really do love everything we create. My go to is a single origin dark chocolate truffle. It’s about as classic and decadent as you can get. Nancy’s first love was the almond macaroon. She quickly moved to the rum ball, mocca roulade, lemon tartlet and napoleon... just about every French pastry we make. Our newest favorite is the Rieger Whiskey Cordial, a collaboration with local J. Rieger & Co. It’s literally a shot of whiskey inside a thin chocolate shell. And it’s incredibly unique and delicious. We now make cordials with their entire line including gin, vodka, and Caffé Amaro (infused with coffee from local company, Thou Mayest). What do you aspire for André's in the future? Brand recognition on a more national level. Do you hope your children will carry on the family legacy? For now, I plan to continue running André's for as long as I can. My focus is to share our passion with the people we love. Our three daughters are the next possible chocolatiers and pastry chefs. I hope that they will grow to share our love for the business, but I will let them follow their own passion. How has being based in Kansas City affected the work that you do? The beginning was very hard, but as the residents of Kansas City learned about what we were creating they embraced and supported us. We count ourselves very lucky to be part of a city that loves the arts, which includes culinary arts. Visit Andre’s in Kansas City at 5018 Main Street and in Overland Park at 4929 West 119th Street. BIRD. The newest way to scoot around Kansas City.